The Lynn Valley Seniors Association (LVSA) is a non-profit, charitable organization dedicated to enriching the lives of seniors in the Lynn Valley area. Since 1999, the purpose of LVSA has been "to explore, develop and coordinate social and recreational services which enhance the health and well-being of seniors in Lynn Valley and to promote the presence of seniors in the community." 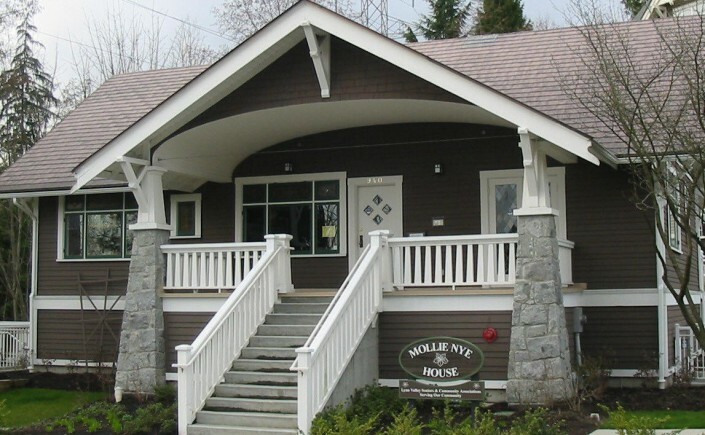 The Mollie Nye House is the home base for the Lynn Valley Seniors Association (LVSA) located at 940 Lynn Valley Road, North Vancouver. LVSA partners with many local agencies and community members to bring workshops and events to Lynn Valley seniors. Please contact us at info@lvsa.ca or leave a message at 604-987-5820. Lynn Valley Services Society (LVSS) operates and maintains “The House” on behalf of the District of North Vancouver, and offers a variety of programs, services and activities, as well as rental space.